Our revolutionary hair loss treatment is the ARTAS® system. It uses a robotic arm to conduct your hair transplant procedure with more precision than any other treatment available. The ARTAS® system is also a minimally invasive procedure. We don’t use scalpels or sutures at RHRLI and there is minimal scarring. Many patients report minimal pain and most patients are back to their normal lives in a couple of days. In addition to ARTAS®, you’ll also experience the RHRLI edge. When you come for your initial consultation our board-certified surgeon, Dr. Baiju Gohil will meet with you as he does with all patients. He will explain every aspect of your treatment and he will conduct your ARTAS® hair transplant procedure. We want well-informed patients, so here’s what you need to know about vitamins and hair loss. In many cases, the article says more research is needed to see what, if any effect vitamin supplements have on hair growth, but there are cases where vitamin deficiencies can cause hair loss. 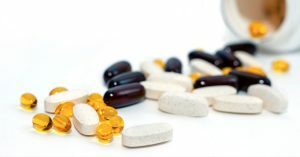 It should also be noted that taking too many supplements can also cause some health issues. Patients with deficiencies in vitamins such as Niacin (B3) can see hair loss, but there’s limited information on whether taking supplements will help. The same is true in studies of Vitamin D2 in women. There’s no known link between Vitamin A or Vitamin E and hair loss, although, in one study, 21 patients who received Vitamin E showed a significant increase in the number of hairs they have, compared to those who were administered a placebo. Some minerals such as zinc have been shown to reverse patients suffering from Telogen Effluvium, resulting from a deficiency in the mineral. Telogen Effluvium occurs when an excess of hair remains in the resting phase of the hair growth cycle. If you’re concerned about losing your hair, RHRLI can help. We’ll examine you and tell you how ARTAS® can give you a brand new healthier head of hair. All you have to do to get started is contact us today. Previous Post: « Can Psoriasis Contribute to Hair Loss?